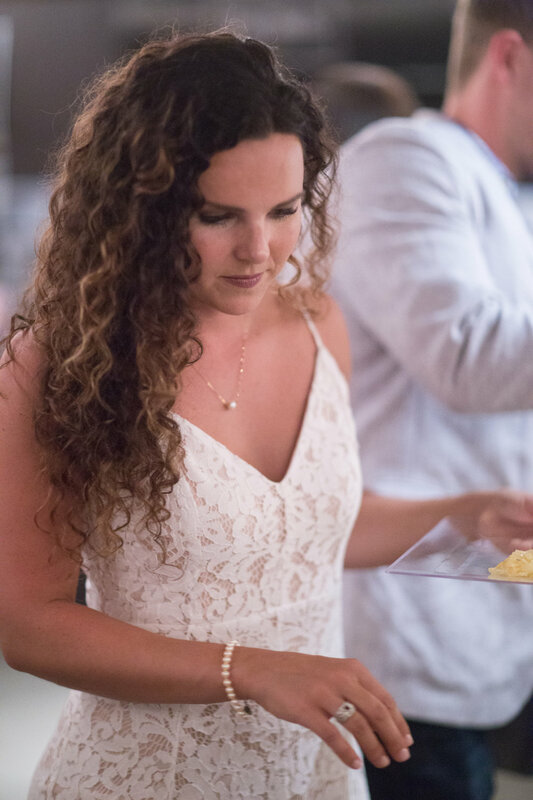 Spoiler alert: Rehearsal dinners are so much fun! I had really underestimated how fun it would be because I was so focused on the wedding day. My friend, if you are about to get married, prepare yourself for two fun days because the rehearsal is truly so special. To help you plan, I will give you the details about our rehearsal, which I loved! My mother-in-law, her best friend and my sister-in-law did an awesome job planning and decorating. I am lucky to have such sweet family! The venue itself has beautiful exposed brick and gorgeous wood tables. My mother-in-law, Claudia played on our wedding colors and did a beautiful black and white scheme. I love how the black and white stripes contrast the rustic look of the event space. The black ribbons on the silverware added a pretty pop to the place setting. She did name plates for the family at the head table, but the rest of the seats were not assigned. It made it easy for people to mix and mingle! Claudia even put thought into the smallest details. I love how she customized the vases with the R and the black and white ribbon. It really tied everything together. Simple greenery lined the head table with lanterns, candles and roses scattered throughout. It was so whimsical and bright! Roses were the centerpieces on the smaller tables. The roses are so pretty and romantic. I love the way they look with all the brick and wood. No table cloths because the tables are so gorgeous on their own! Three words... breakfast for dinner. We had everything from cinnamon rolls, to biscuits, to waffles and breakfast casserole. There was plenty of fruit and some delish pastries for dessert. It was really fun to do something different and more casual. 929 catered the entire meal and they did an awesome job. Since it is a coffee shop, of course there was a coffee bar. We were really happy with the selection and I think our guests enjoyed it too! I adored the tiny details! These modern placemats were a fun addition to the table. Again, the personal details meant so much to me! There were baby photos of Hunter and me filling an entire wall of the space. The center of the wall has pictures of the two of us. It was funny for guests to see them as they went to the buffet line. Obviously I am a horrible blogger because I never got a full length photo of my outfit. I guess I was too busy crying and hugging people. Oh well! I loved this midi dress from Lulu's! It was comfortable and had a really pretty jagged hem. I wore simple white ankle strap heels. LA Green in Starkville helped me with my accessory game! These earrings were so much fun and added just the right amount of personality to my outfit. I can't wait to wear them again next time I dress up! ...but I seriously never take either of them off! I highly recommend investing in a real pearl set because they are so versatile and will never go out of style. 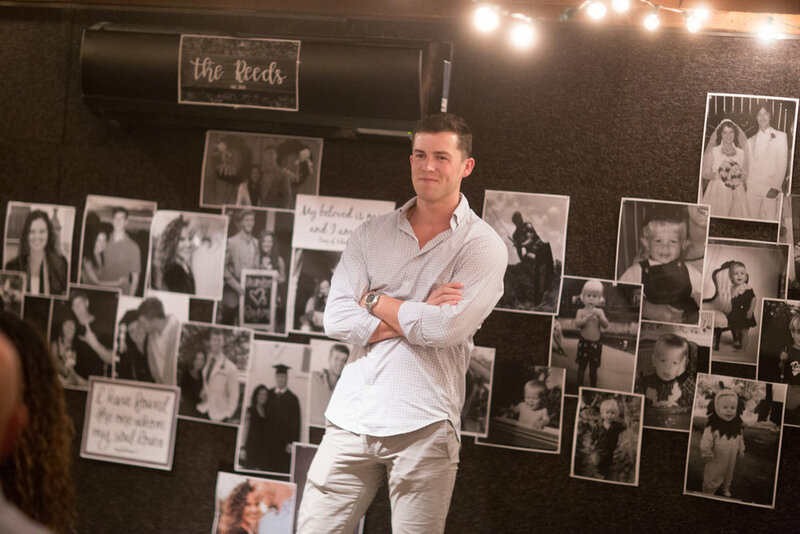 At your rehearsal dinner and your wedding you will be so eager to greet guests and take pictures that you will undoubtedly get separated from your fiance for a good period of time. Here's my tip: don't. There was one point where I looked up and we were an hour into our reception and I hadn't seen Hunter. After that my bridesmaid, Joely, made a POINT to not let people pull us apart and I am so glad that she did. It is easy to let time slip by and if your entire event passes and if you haven't kissed at the dinner table or spun around on the dance floor, you'll be disappointed. So stick together! Enjoy your guests but remember, you are there for each other at your rehearsal and your wedding. Don't waste a single moment! Feel free to text, call, slide in my DMs, or email me for more information about our rehearsal. Really, there's no way you can go wrong when everyone you love is together in honor of a commitment you are making to your fiance, your family and to God. There is really nothing like it! More wedding round ups to come.